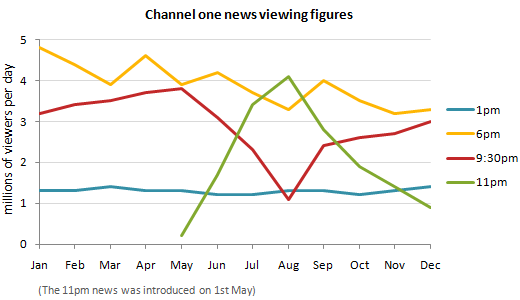 The chart shows the average daily viewing figures for Channel One News over a 12-month ..................... The figure for the 1pm News remained fairly stable, .................... at around 1.3 million throughout the year. The figure for the 6pm News began the year at 4.8 million. It ...................., but the general .................... was downwards, and it ended the year at 3.4 million. The figure for the 9:30 News gradually increased from 3.2 million viewers per day in January to a .................... of 3.8 million in May. However, this month saw the introduction of the 11pm News, and the figure for the 9:30 News ...................., hitting a low-point of 1.1 million in August. In the same period, the figure for the 11pm news .................... from 0.2 million to 4.1 million. At this point, the trend reversed. From August onwards, the figure for the 9:30 news grew ...................., reaching 3 million by the end of the year. ...................., the figure for the 11pm News declined sharply, and in December fell below the 1 million mark. When talking about statistics we say that figures reach a peak of or peak at: The number of viewers reached a peak of 3.8 million / peaked at 3.8 million in May. The opposite of a peak is a low. The word trough also has this meaning, but is usually used together with the word peak: The number of viewers fell to a low of only 1.1 million in August. The figure has its peaks and troughs.